Life goes on here in Beautiful Baia Mare. The schools have ended and the sun is shining. And fourteen new volunteers have arrived in the YMCA. Last weekend was their first one here and we had fun fun fun!! On Thursday we went to Karaoke in Logout bar and yours truly sang........ I have many talents but singing is not one! Friday the new recruits had their induction training and I focused on my new hobby ..... programming , I'm learning with Khan academy! Check it out! 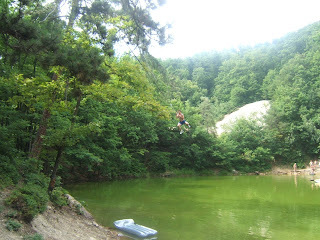 Saturday we went to the so called "Blue Lake"...... yet it's green...... and had a swim! It was awesome! I have also decided to try a new traditional cure against the dreaded mosquito, gin and tonic. Like a champion I took my medicine diligently on Saturday night. And wok up with eight new bites on Sunday morning and a sore head! The next cure? Garlic.... I hope my new friends will tolerate the smell!! "A change is as good as a rest"
Welcome back to Orla's adventures!